The Hole-in-the-Rock Trail provides unique opportunities for groups to experience some of the challenges faced by Mormon pioneers who accomplished what was deemed as impossible. Groups are welcome to utilize the facilities at the Bluff Historic Fort. Groups wishing to camp along the Hole-in-the-Rock Trail or visit select sites, such as the Hole-in-the-Rock crevice or San Juan Hill, will require a permit from the BLM. Click on the Trekking Details PDF document below for details. Although handcarts were not part of the Hole-in-the-Rock journey, it is possible to combine a Hole-in-the-Rock Trail experience with a handcart trek at select sites near Bluff, Utah. Handcarts are available from the Hole-in-the-Rock Foundation in Bluff, Utah. See the Trekking Details document below for more information. Photograph: Kanab Stake - Handcart pull near San Juan Hill, 2010. 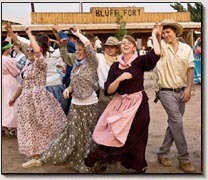 To request an information packet, please email is at inquiry@hirf.org or call the Bluff Fort Visitors Center, 435-672-9995. The packet includes copies of the the Past Trekking Experiences and the Trekking Details documents posted below, as well as informational DVD's. Please contact us for recommendations and assistance in planning and carrying out a Hole-in-the-Rock Trail experience. Photo: Cedar City Stake trekking to the Hole-in-the-Rock Crevice -2010.